Middlesbrough Council has signalled its commitment to helping end mental health discrimination. 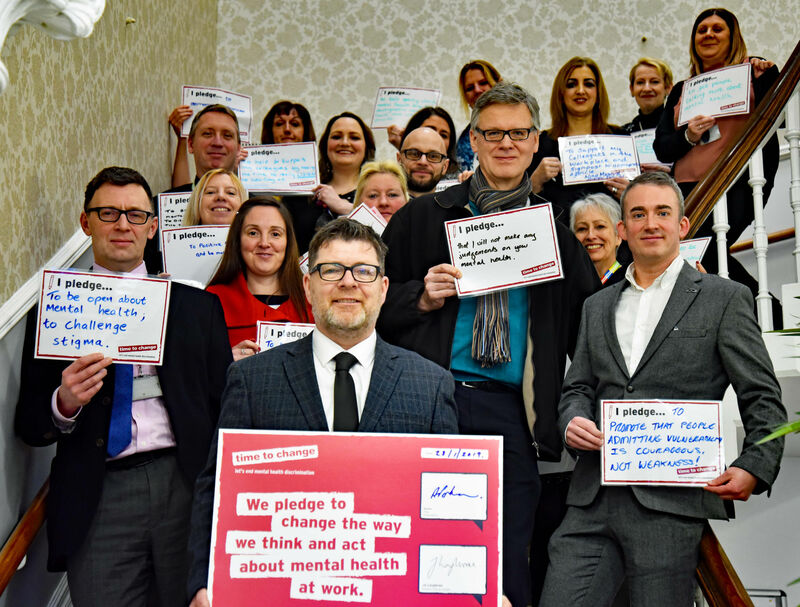 The authority has signed up to the Time to Change employer pledge, making it part of a growing social movement to support people to open up about mental health problems. By signing, the Council undertakes to change the way it thinks and acts about mental health in the workplace. At a ceremony in the Town Hall, officers from across the Council pledged their support to Time to Change with an action plan of activity aimed at breaking the silence that surrounds mental health issues. The Council joins more than 450 companies and organisations including E.ON, British Gas, Ernst & Young, Transport for London, Royal Mail, Barclays, Shell, Pepsico, the Church of England, Sunday Mirror, Marks and Spencer that have signed up to the pledge. And this Thursday (February 7) is #TimetoTalk day – a national campaign aiming to get more people talking about mental health, including in the workplace. At the signing session, Middlesbrough Council Chief Executive Tony Parkinson shared stories and self-care tips with colleagues. He said: “Over the last two years we have introduced a range of initiatives aimed at making Middlesbrough Council a great place to work, and signing up to the Time to Change pledge is another step on that journey. “It’s well known that one in four of us will experience mental health issues at some point in our lives. “Not only that, but nine in ten people who have experienced a mental health problem have faced negative treatment from others as a result. “We need to break the silence and remove the stigma around mental health, and that’s why we have signed the Time to Change Employer Pledge. “Everyone’s attitude makes a difference and it’s fantastic to see organisations like Middlesbrough Council taking the lead. “Many leading employers have found that making a strategic commitment to the mental wellbeing of their workforce not only benefits their staff but also their bottom line, improving productivity and staff retention.